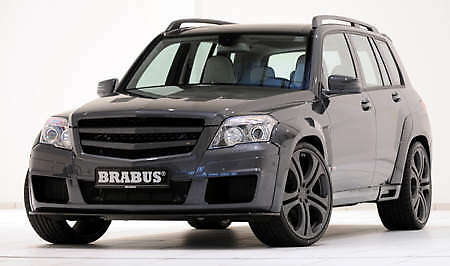 We can always depend on Brabus to come up with speed record breaking machines, and now is the turn of the SUV. The famed Mercedes-Benz tuner has dumped a bi-turbo V12 into the not very pretty GLK to achieve a top speed of 322.3 km/h, a new speed record for street-legal SUVs. 0-100 km/h takes 4.2 seconds and 0-200 km/h takes 12.8 seconds. Based on Merc’s V12, the Brabus SV12 R Biturbo 750 engine produces 740 bhp at 5,500 rpm and peak torque of 1,350 Nm at 2,100 rpm, but electronically limited to “just 1,100 Nm”. Displacement is increased to 6.3 litres (from 5.5) and the valve heads are precision-machined and fitted with special camshafts. There are also two larger turbos and more efficient intercoolers, while a free-flow catalyst and full stainless-steel exhaust improves breathing. Power is transferred to the rear wheels via a reinforced five-speed auto ‘box and LSD with locking rate of 40 per cent. Brabus’s coilover sport suspension is height-adjustable on both axles and features ten selectable settings each for bound and rebound. Brakes? 12-piston aluminum fixed calipers with vented and 380mm grooved steel discs up front and a six-piston fist grabbing 360mm discs for the rear are tasked with stopping this fast SUV. Crazy car, crazy price. The Brabus GLK V12 starts at 397,000 euros! Previous Post: 2 new Suzuki models coming next year?